When the weather gets cold and the nights get long and bleak, it’s only natural to start thinking of having a feast. Food can be used to feast with family and friends, set the mood on Christmas Eve or ring in the new year. That’s why, in many countries—including some who don’t technically celebrate Christmas—you will find seasonal fare being cooked up around this time of year. Cougnou loosely translates as the “bread of Jesus” and is baked during the Christmas season in southern Belgium. It is a sweet, yeasted bread that is shaped into the form of a baby (or just has a small plastic baby pushed into the top of the dough, a la New Orleans’ king cake). It is usually sold from early November onwards and typically enjoyed with a cup of hot chocolate. If you like to eat dessert foods for breakfast, then bibingka is the dish for you. It’s a sweet rice cake made with coconut milk (and sometimes eggs) that is cooked in a clay pot lined with banana leaves. The resulting cake is then eaten for breakfast over the Christmas period, often topped with butter, sugar and toasted coconut. Black cake can be found throughout the Caribbean but is sold—and whipped up by home bakers—predominantly in Jamaica. Made in a similar way to the UK’s Christmas cake, it is a dark, rich fruit cake made with dried fruits and citrus peels that have been soaked in alcohol. Tradition has it that the longer you soak the fruit, the better it will taste, hence why some cooks let it sit for up to two years. 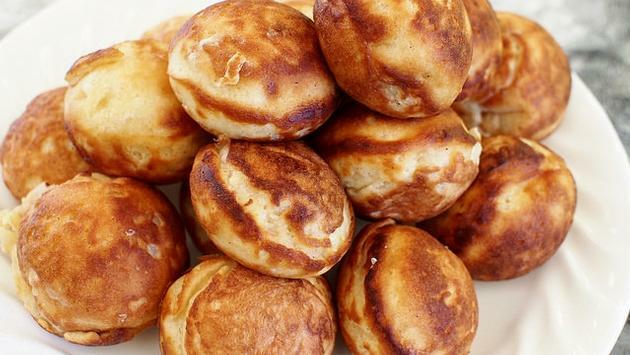 Aebleskiver are small, round, puffed-up pancakes that are cooked in special cast iron pans on the stovetop. These hot little pancakes are then dusted with confectioners sugar and a blob of fruit jam and are served up all throughout Denmark in December. Families across Central Europe catch carp each year and then keep them in their bathtub (hence why the dish also has the name of “Bathtub Carp”). If you can manage not to befriend the fish and keep it as a pet, then you serve it breaded and fried with several other main dishes on the night before Christmas. Menudo is a traditional soup that can be served at any type of special occasion (births, marriages, celebrations) but is usually reserved for the main Christmas meal. It is very labor intensive to prepare, as the main ingredient is tripe—which needs to be boiled in broth for several hours before serving. In fact, many Mexicans start making it on Christmas Eve to ensure it’s ready to eat the next day. Other ingredients may include hominy, red chili peppers, onions and cilantro.